From the endless views of mountain tops, the blooming deserts, or the history filled hikes on Indian reservations the land in Arizona is anything but ordinary. Home to the Grand Canyon, Arizona is the 6th largest state in the U.S and is located in the American Southwest. A state that captures the hearts of many and relentlessly delivers a range of adventure such as hiking, rafting, biking and more. I had the luxury of visiting five different regions of Arizona: Willcox, Bisbee, Tempe, Tucson, and Sierra Vista. Composed of approximately 85 percent national forests ,national parks, recreation and wilderness areas and 'sky-islands', you can imagine the beauty captured during the trip. Below I've compiled the ultimate must stop attractions for individuals seeking adventure as well as scenic stops to take in the picturesque moments across the state of Arizona! The Saguaro Cactus and The Blooming Palo Verde at Picacho Peak State Park. Whether its the 1,500-ft. high peak, the Civil War battlefield, or simply the love for nature, Picacho Peak State Park has a lot to offer. Surrounded by the state flower, Palo Verde, as well as various forms of cactus such as the Saguaro Cactus (which only blooms in central Arizona, and Northern Mexico). The re-enactment of 'The Battle of Valverde' happens at the park each year and draws in a crowd of 2,000-3,000. The park boasts a variety of hiking trails outlook spots, and even a camp grounds in which guests can enjoy daily. The Hunter Trail at Picacho Peak even won "Best Winter Hike". For additional information click HERE. When visiting Kartchner Caverns State Park, not only will visitors be in awe of the natural formations but there are numerous hiking trails as well. Founded by Gary Tenen and Randy Tufts, Kartchner Caverns is one of Arizona's many treasures. After millions of dollars were spent to preserve the cave and its formations the cavern finally became open to the public in 1988. Two tours are given of the facility - Big Room Tour and the Rotunda/Throne Tour. Visitors can see a variety of natural formations such as: cave bacon, helictites, soda straws, stalactites, stalagmites and more. Visitors can also get a glimpse 45,000-year-old bat guano, one of the worlds largest soda straw stalactites, and a 58-foot high column called the Kubla Khan, the largest column formation in Arizona. Other features publicly accessible within the caverns include Mud Flats, Rotunda Room, Strawberry Room, and Cul-de-sac Passage. Each of the tours take a bit over 90 minutes and give you a great glimpse of the discoveries, and the role water plays in creating the caverns. Be sure to reserve yur cave tour tickets in advance. Natural Formations at the Chiricahua National Monument! From a volcanic eruption over twenty seven million years ago comes the natural beauty of the Chiricahua National Monument. A mecca for hikers and birders, the Chiricahua National Monument is the intersection of the Chihuahuan and Sonoran deserts and the southern Rocky Mountains as well as the northern Sierra Madre in Mexico. The monument delivers stunning views, exquisite hikes as well as a bit of history and is one of the premier areas for biological diversity. "The park has a full range of human history and for a small place there is a ton of stuff to see and learn about," states park ranger Suzanne Moody. "I'm in the field of interpretation and public education, and I still learn and see something new everyday." As far as history is concerned the Chiricahua National Monument is home to the 'Faraway Ranch' as well as home to a few Swedish immigrants Neil and Emma Erickson, and their children. The house still stands today and tourists can get a glimpse of 'life on the ranch' as its filled with historic artifacts from the earlier twentieth century. The Faraway Ranch Operated Until 1975. Since Then it Has Been Open For Tours to the Public. Guests will immediately fall in love with the small town of Bisbee. From vintage decor to the cute shops and the warm locals will immediately feel at ease and at home while in the town of Bisbee. One of the 'off the beaten path' stops in Arizona (but well worth the 'detour') is Bisbee - a town of 5,400 people. "From the very beginning I came to visit. It's not glitzy but every knock and cranny whispered home for me," stated Debbie from Belleza Art Gallery "I thought it was a sensation and i know this will remain my home." There is something about the town that draws individuals. Anyone that knows Bisbee refers to it as 'a small town with a big difference', one quick stop here and you'll see why. Guests will have the chance to 'go to work' and get outfitted in a hard hat, miners headlamp, and a yellow slicker as they descend into the Queen Mine Tour. The tour gives a glimpse of what the job entailed years ago as well as see the techniques and dangers of mining in one of the most prosperous mines back in the day while hearing stories from a Queen Mine veteran! Each Hotel Room Has a Different Theme to Keep the Warmth and Feel of The West. A town that needs no introduction, Tombstone, AZ is everything you could imagine it. The town boasts a wild west lifestyle like no other and embrace it! From gun shows to dust filled roads with horses as their main transportation, Tombstone is a trip down memory lane where you can let your imagination run free. Visitors of the 'old west' will also get a little historical taste of the O.K. Corral and see re-enactments of the famous Wyatt Earp and doc Holliday gun fight. You'll see just where the legendary gun battle began in the wild wild west! For a taste of southern hospitality and to take advantage of your surroundings in Tombstone, book a room at the ranch! The epitome of 'dude ranch' guests will be surrounded by the west on this 18-room style ranch. Each room has a different theme but all are surrounded of the Dragoon Mountains and vies of the Huachuca and Santa Rita mountain ranges. The property also has horses on site where guests can take a 3-mile-ride into town! Known as the Wests' most iconic town, Tombstone is a must see! A Close Up of Hummingbird Banding at the San Pedro House. Take a quick detour into San Pedro House where you can see a few remarkable trees as well as see a hummingbird banding demonstration by Sheri Williamson who wrote "Peterson Fied Guide to Hummingbirds". Arizona gets up to 15 different species of hummingbirds out of the 360 in the world (25 or 26 being in the US). "Hummingbirds are fascinating, they seem so magical and yet they are real living creatures," stated Williamson. "They managed to get their claws into our souls, I got so immersed in them that they took over my consciousness." Banding the hummingbirds assists with the study and tracking of hummingbirds, their migrations patterns, different breeds, and life span. Located in the Sonoran deserts of Arizona Tucson is a city that has an immense amount of untouched history. Take a stroll down old town where you will see sites such as Hotel Congress with the infamous bank robber John Dillienger. Tucson serves as the central hub for culture and entertainment. Ready to Hit the Streets of Tucson! 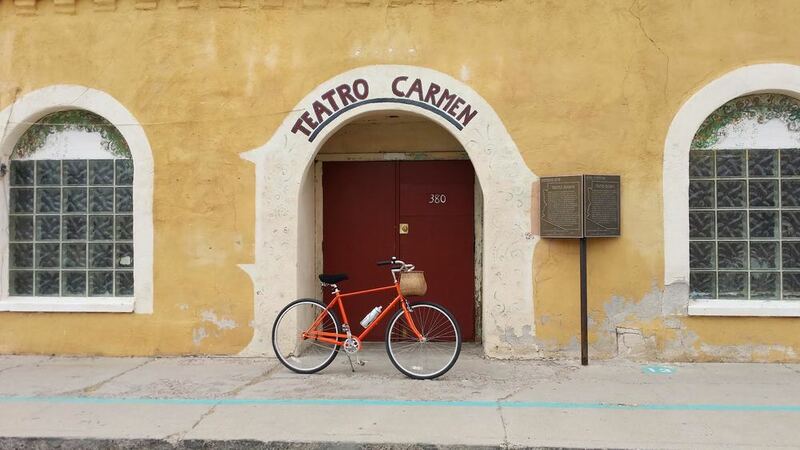 Offering a variety of bike tours ranging from 5.5 miles - 11 miles the Tucson Bike Tour is the best way to fully experience Tucson and all of its glory and beauty. Guided tours by founder Jimmy Bultman will educate visitors on the many historical facts and hidden gems in the city. "I can't believe this my job", Bultman has exclaimed as he loves showing people the eclectic mix of sights and stories that come alive in the city of Tucson. The high record heat, the variety of cactus and wildlife, not to mention the beautiful vistas - it's easy to get lost in the beauty of Arizona. Not only does Arizona have glorious views of endless mountain tops and hiking destinations for thrill seekers, it also serves as a rich culinary pot with extravagant housing accommodations . Click HERE to to view our favorite picks!